Heidenreich, C.e.. "Ste Marie Among the Hurons". The Canadian Encyclopedia, 21 June 2016, Historica Canada. 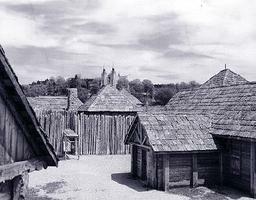 https://www.thecanadianencyclopedia.ca/en/article/ste-marie-among-the-hurons. Accessed 20 April 2019. Sainte-Marie Among the Hurons was a Roman Catholic mission that worked among the Huron. Begun in 1615 by the Récollets, it was renewed in 1634 by the Jesuits with the arrival of 3 priests led by Superior Jean de Brébeuf and assisted by 5 domestics. In 1638 Jérôme Lalemant arrived as the new superior; by 1639 there were 13 fathers active among the Huron and Petun. Construction began in 1639, 5 km southeast of present-day Midland, Ont along the Wye River. The structure, dedicated to the Virgin Mary, was named Sainte Marie, or Notre Dame de la Conception. At its busiest in 1648 it housed 19 priests, 4 lay brothers, 23 donnés, 4 boys, 7 domestics and 8 soldiers. By the late 1640s, besides their missions to the Huron (St Joseph), the Jesuits at Sainte Marie also had missions to the Petun (Les Apôtres), the Nipissing (St Esprit), the Ojibwa and Ottawa (St Pierre) and some Algonquian bands along Georgian Bay (St Charles). In 1648 the Iroquois began a series of devastating attacks on the Huron and a year later on the Petun (see Iroquois Wars). Five Jesuit fathers who worked out of the mission lost their lives: Antoine Daniel (4 July 1648), Brébeuf (16 March 1649), Gabriel Lalemant (17 March 1649), Charles Garnier (7 December 1649) and Noël Chabanel (8 December 1649); all were canonized by Pope Pius XI on 29 June 1930. In the spring of 1649 (either May 15 or June 14) the mission was withdrawn, and Sainte Marie was burned by its occupants lest it fall into Iroquois hands and suffer desecration. A new Sainte Marie was built and occupied for one year on Christian Island in Georgian Bay. With further defeats of the Huron and Petun, and following a severe winter famine, the mission was removed to Québec on 10 June 1650. Exploratory excavations at Sainte Marie were conducted as early as 1855 by Father Felix Martin, Society of Jesus. Serious archaeological work began in June 1941, directed by Kenneth E. Kidd for the Royal Ontario Museum and the Jesuit order. Because of budgetary constraints the work ended in 1943, but it had resulted in the excavation and meticulous documentation of most of the mission's central section. Excavation was completed 1947-51 by Wilfrid Jury, then curator of the Museum of Indian Archaeology at the University of Western Ontario. In 1964 reconstruction began under Dr Jury for the Ontario government. The reconstruction has drawn considerable scholarly criticism because Jury's archaeology, and therefore his justification for the reconstruction, have not been made public, and because Kidd's work was ignored. Nevertheless the workmanship and lively interpretive programs make Sainte Marie an excellent educational and tourist facility. The attached museum begins with an outline of conditions in 17th-century France and proceeds to trace the historical development of Québec, the mission at Sainte Marie and life among the Huron. Although not part of the Sainte Marie complex, the adjacent Martyrs' Shrine, built in 1926 and operated by the Jesuits, attracts pilgrims and evokes the spirituality that motivated the founding of Sainte-Marie. See also Christian Religious Communities; Saints.